The Carnival Liberty is a large mainstream cruise ship of Carnival Cruises that sails to the Bahamas and the Caribbean year-round. Since the ship cruises to warm, sunny destinations, many guests like to spend as much time as possible outdoors. These Carnival Liberty pictures focus on the outdoor deck areas of the ship and also show some exterior views. On a sunny day in the Caribbean, the deck 9 pool deck is the busiest place on the Carnival Liberty cruise ship. 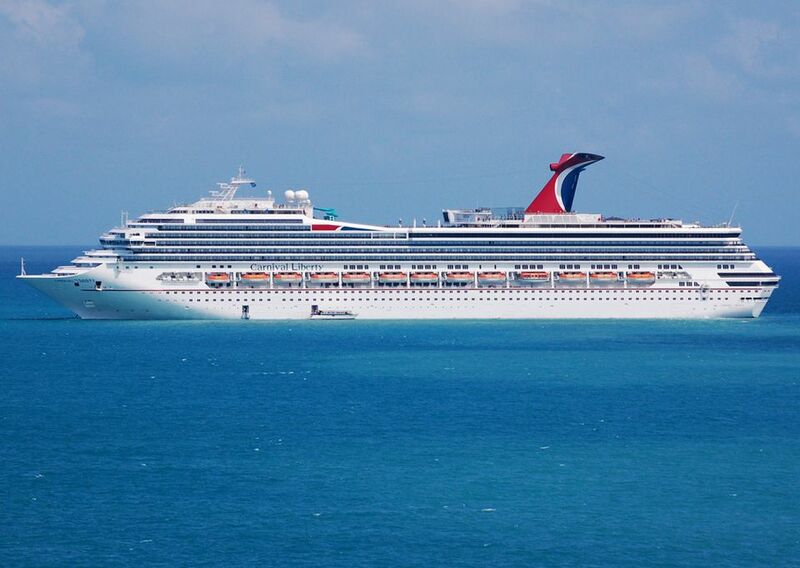 Guests on the Carnival Liberty have lots of fun outdoors by the pool and on the water slide. Those who don't want to use the water slide can relax in one of the Carnival Liberty's hot tubs or lounge chairs. The multi-level platforms are perfect for people watching. The Carnival Liberty's movie screen is used throughout the day for news, games, and talk shows, and in the evening for movies. Sometimes it is very loud, which adds to the overall excitement and fun, but those who like to relax in the sun or shade will need to look elsewhere. If you have a balcony cabin, it's perfect. If you don't, the cruise ship has many outdoor areas that are much quieter than right next to the movie screen and swimming pool. Go exploring, and you will find one. One option is the Versailles pool located aft on deck 9. This pool can be covered. Another place to swim is the Tivoli pool located outdoors and mid-ship on deck 9. This view of the Seaside Theater shows how perfect it is for watching movies outdoors. The Seaside Theater is found on deck 10 of the Carnival Liberty. The RedFrog Rum Bar is conveniently located next to the mid-ship swimming pool on the Lido Deck. On the opposite side of the Tivoli pool from the RedFrog Rum Bar is the BlueIguana Tequila Bar. Guests can choose their favorite tropical drink—rum or tequila. The Carnival Liberty Sports Deck on deck 11 is a popular place for basketball, volleyball, and other outdoor activities. Most cruise travelers tend to overeat and/or overdrink when on their cruise vacation. Walking or jogging on the deck 11 track while on the Carnival Liberty is a good way to help keep those extra pounds away. The cruise ship also has an indoor fitness center with all sorts of the latest workout equipment. The Carnival Liberty miniature golf course is found on deck 12. The funnel looks like it serves as an extra hazard. Serenity is the Carnival Liberty's adults-only outdoor retreat and relaxation area. It is located on decks 12 and 14. (The cruise ship doesn't have a deck 13). Clamshell lounges always look so cozy and restful, don't they? The Carnival Liberty Serenity adult retreat is quieter than the other outdoor decks and has many different kinds of comfortable lounge chairs. The Carnival Liberty Serenity outdoor adult retreat doesn't have a swimming pool, but it does have a hot tub. Many of those seeking a quiet spot prefer soaking in a tub to paddling around in a pool. These hammocks on the Carnival Liberty are usually full. However, you might grab one when the ship is in port and most all of the guests are ashore.